CUE Art Foundation is pleased to present a solo exhibition by Nancy Floyd. Titled Weathering Time, the exhibition features selections from Floyd’s archive of photographs exploring the genre of self-portraiture. Spanning thirty-five years, the ongoing series comprises thousands of varied images that form an intimate account of Floyd’s daily life. Her project tackles profound questions of ritual, purpose, and the assumed agency of photography. Floyd began photographing herself in 1982, standing in front of her camera each morning with a cable release. She has maintained this visual diary from her time working as a waitress after college to her retirement after a career as a professor of photography. Pets, friends, and family members appear alongside Floyd in some photographs—time marks their bodies as well. She captures her nieces from infancy to motherhood, when they are shown holding infants of their own. Unedited, the archive includes underexposed photographs, out-of-focus images, and blank frames that mark the days on which Floyd failed to take a photograph. 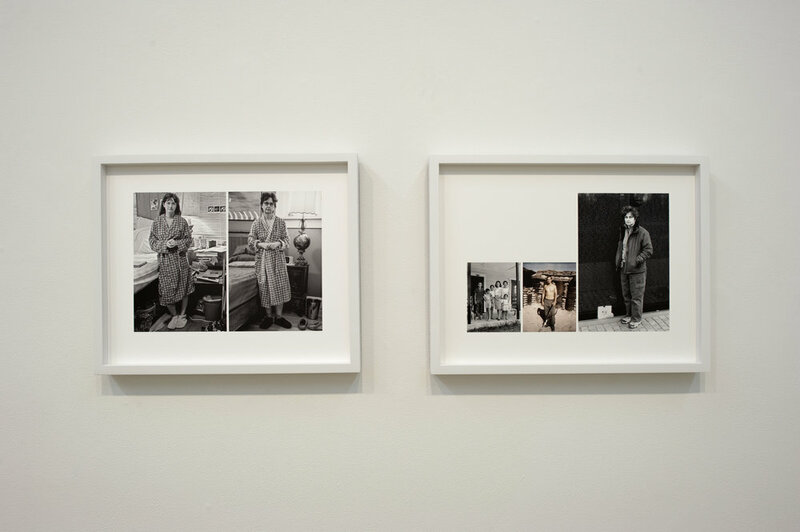 In 1958/1982/2012 (2015), Floyd juxtaposes a childhood snapshot with two photographs from her series. The adult Floyd holds the frame directly in the center of the images, leaning slightly to her left with hands folded behind her back. Taken thirty years apart, the images are remarkably similar, despite changes in hair styles and architectural details, presenting the viewer with a poignant, singular comment of the passage of time. For this exhibition, Floyd’s photographs are installed in grid formations that allude to her project’s intersecting timelines and documentary methodology. One piece is made up of thirty-five individual photographs, one from each year of Floyd’s series. Another work, Pants 1982-2016 (2017), tracks the changing styles of Floyd’s pants in fifteen images that span four decades. In addition to photographs, the exhibition also includes descriptive texts from the archive, as well as a video slideshow of Floyd’s complete archive. Nancy Floyd has been an exhibiting artist for over thirty years. She has received numerous grants and awards including a 2015 Society for Photographic Education Future Focus Project Support Grant and a 2014 John Gutmann Photography Fellowship Award. She was also a runner-up for the 2017 Aperture Portfolio Prize. Temple University Press published her first book, She’s Got a Gun, in 2008. Floyd’s work has been exhibited in numerous venues including Solomon Projects, Atlanta, GA; Flux Projects, Atlanta, GA; the Atlanta Contemporary Art Center; White Columns, New York, NY; and the California Museum of Photography, Riverside, CA. Since 2009, her work has been part of the Elizabeth A. Sackler Center for Feminist Art Archive, Brooklyn Museum, Brooklyn, NY. Floyd holds an MFA from the California Institute of the Arts and lives in Atlanta, GA.
CUE’s exhibition program aims to present new and exceptionally strong work by under-recognized and emerging artists based in the United States, and is committed to exhibiting work of all media, genres, and styles. This exhibition is a winning selection from the 2016-17 Open Call for Solo Exhibitions. Floyd’s work was unanimously selected by a jury comprised of panelists Herb Tam, Curator and Director of Exhibitions at the Museum of Chinese in America; Michelle Grabner, artist and writer; and Leslie Hewitt, artist. In line with CUE’s commitment to providing substantive professional development opportunities, panelists also serve as mentors to the exhibiting artists, providing support throughout the process of developing the exhibition. We are honored to work with Leslie Hewitt as the artist-on-artist mentor of this exhibition. Leslie Hewitt studied at the Cooper Union for the Advancement of Science and Art, Yale University’s School of Art, and at New York University, with a focus on Africana and Visual Culture Studies. Hewitt has held residencies at the Studio Museum in Harlem, the Museum of Fine Arts, Houston, the Radcliffe Institute for Advanced Study at Harvard University and the American Academy in Berlin, Germany amongst others. Her work is in public collections at the Museum of Modern Art, NY; Guggenheim Museum, NY; Los Angeles County Museum of Art, CA; The Whitney Museum of American Art, NY, among others. She was a faculty member at Barnard College in the department of Art History from 2012-2017; and has recently joined the faculty of the School of Art at The Cooper Union for the Advancement of Science and Art. The exhibition is accompanied by a 32-page color catalogue, with texts by Nancy Floyd, Leslie Hewitt, and Shantay Robinson. The catalogue is available online, and free of charge to gallery visitors. For more information please contact Programs Director Shona Masarin-Hurst at shona@cueartfoundation.org.